Threats to loons on Lake Temagami. By Doug Payne. Island 1213. Loons are so serene and beautiful to watch, it is hard to imagine the risks they face of death, illness, and reduced productivity. This article will discuss the most important of these: lead, mercury, and botulism. Loons are exposed to lead in the forms of fishing jigs and other tackle, sometimes from the bottom of the lake after a fishing line breaks, or most likely from eating a fish which has ingested a lead jig and broken the line. The lead gets into the loon’s blood stream and rapidly kills the loon. Only a tiny amount of lead is required to kill a loon, no more than a tenth of a gram. Loons are plentiful in New England, and they are observed carefully by cottagers. Virtually all loons found dead in New England, from whatever cause, are sent to Mark Pokras, an Associate Professor at the Tufts Cummings School of Veterinary Medicine in Grafton, Massachusetts for autopsy. Consistently over the years, about half of these loons have died of lead poisoning, based on x-ray identification of the lead jig and the finding of the jig in the loon’s gastrointestinal tract. During the last year New Hampshire banned the sale of lead fishing tackle. 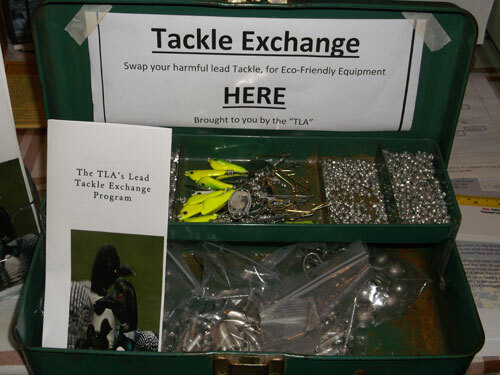 The TLA has made a considerable effort over the last few years to exchange non-lead tackle for angler’s lead tackle. Non-lead tackle is widely available from multiple sources. 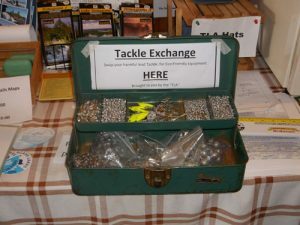 The Loon Preservation Committee in New Hampshire finds most useful tackle from Timmy Tom’s Lead Free Jig Company in Arkansas (http://timmytoms.com/). Elemental mercury enters the atmosphere from smoke from coal burning power plants, mostly from the northeastern States. It falls in rain to soil and water bodies, where micro­ organisms convert it to an organic form, methyl mercury, which can be passed on up the food chain to other fish and animals that eat the micro-organisms. The details have been elucidated in publications from the Biodiversity Research Institute in Maine ( www.briloon.org ) for both upland birds and waterfowl. Mercury exposure can be, but generally is not fatal for loons and other waterfowl. However, it can cause neurological behavioral abnormalities and negatively affect productivity. Eggs may not hatch, and if they hatch, the chicks may show severe neurological behavioral abnormalities. In order to ascertain whether Temagami loons might have dangerously high mercury levels, sport fish were caught last summer and mercury levels in their tissue were measured in Dr. Murray Richardson’s lab at Carleton University in Ottawa. The levels were reported in the Winter 2014 Temagami Times and were considered moderate. However, levels in adult fish are a long way from levels in small fish and in adult loons and chicks. I submitted Murray’s data to Neil M. Burgess of the Canadian Wildlife Service, Atlantic Region, Environment Canada. Dr. Burgess has an extensive research background in mercury analysis of fish of various sizes and adult loons and loon chicks. He assured me that, based on the mercury levels in our adult fish, it is very unlikely that Temagami loons have dangerous mercury levels. At a recent research meeting at the Loon Preservation Committee in New Hampshire I met David Evers, Director of the Biodiversity Research Institute in ME, which has a long history of research in loons and their diseases. David informed me of the serious loss of loons from Botulism in the Great Lakes, specifically 7000 dead loons found on the shores of Lakes Erie and Ontario. “Botulism outbreaks are causing extensive mortality of fish and fish­ eating birds in the Great Lakes. Botulism results from ingestion of neurotoxins produced by the bacterium Clostridium botulinum, which leads to paralysis and death of intoxicated animals. Periodic outbreaks of type E botulism have occurred in the Great Lakes since at least the 1960s, but outbreaks have become more common and widespread since 1999, particularly in Lakes Michigan, Erie, and Ontario. Botulism has been responsible for over 80,000 bird deaths on the Great Lakes since 1999. So the neurotoxin in this organism works its way from micro-organisms in the lake bottom up through zebra mussels and into 2-6″ round goby fish, which are consumed by loons. The loons become paralyzed, cannot breath, and die. Is the loon population on Lake Temagami decreasing, and, if so, have Temagami loons migrated across Lakes Erie and Ontario and died from Botulism? This question makes the new TLA loon population survey particularly relevant. Continuing this survey on a yearly basis will be important. 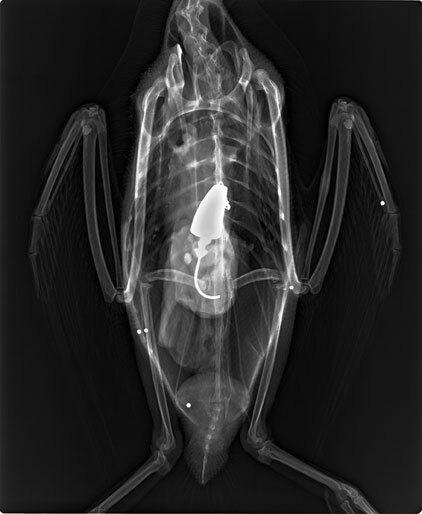 X-Ray image courtesy of Dr. Mark Pokras, Associate Professor, Department of Infectious Disease and Global Health, Tufts Wildlife Clinic and Center for Conservation Medicine. Tufts University, Cummings School of Veterinary Medicine.